Table of Contents Next: Hutchinson, Donald R.
Naval Historical Center #NH 104546. Hustvedt was a gunnery expert who had been an observer at the bombing test against Alabama in 1921. A highly competent officer, he received top ratings from the secret ad hoc selection board convened by Navy Secretary Knox in March 1942. 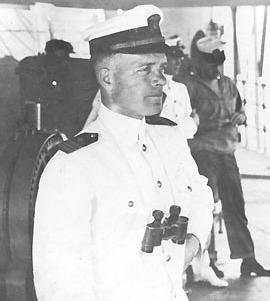 However, the diminished role of battleships in the war meant that his own combat service was limited to command of a battleship division during the Marshalls campaign.